Has the U.S. Military “Gone Rogue”? Is the U.S. military defying the commander in chief’s orders? Psychopaths at the big banks… the lure of borrowing in depreciating dollars… Uber and the “Pittsburgh left”… and more! We pick up this morning where we left off yesterday — the elite conceit in Washington that everything bad in the world is Vladimir Putin’s fault. Only today our take is rather more serious. It’s not about blaming the Russian president for toenail fungus or the Brangelina divorce or even — as Hillary Clinton countenanced this week — aiding the twin bombings in New York to help elect Donald Trump. No, now we’re talking about the civil war in Syria — which has killed hundreds of thousands and displaced millions. And we’re talking about the possibility the U.S. military has gone rogue and doesn’t actually answer to the commander in chief. On Monday, an international aid convoy in Syria came under attack. Eighteen of the convoy’s 31 trucks were hit. Some 20 people were killed. The 78,000 people in the city of Aleppo counting on the convoy for food and medicine will have to wait a while longer for relief. Given the proverbial “fog of war,” it’s hard telling who carried out the attack, or even what form the attack took: Was it bombing from the air, or artillery strikes from the ground? But as far as the White House is concerned, even if the Russkies didn’t do it, it’s their fault. Not only is the attack their fault, so is the fact a 10-day cease-fire in Syria has fallen apart. That’s a brazenly context-free accusation… in light of the fact a few days earlier, U.S. warplanes bombed the Syrian army, killing 62 troops. 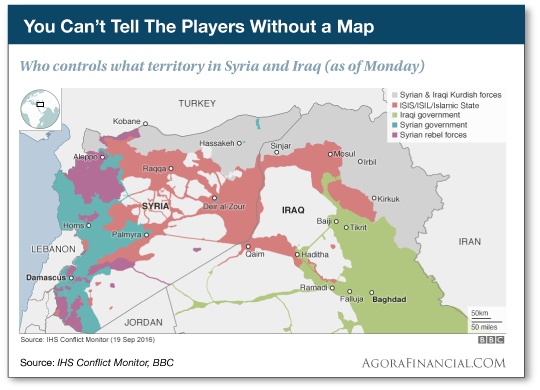 But the U.S. government also wants Syrian President Bashar al-Assad gone, oblivious to the reality that Assad’s fall would leave either ISIS or people nearly as berserk as ISIS (“Syrian rebel forces” on the map) in charge. Still, Washington officials apologized, regretting “unintentional loss of life” and saying the whole thing was a big mistake. Recall that Russia intervened in the Syrian civil war a year ago on the side of its longtime Syrian ally, President Assad. Russian forces have been bombing ISIS, but they’ve also been bombing allegedly “moderate” jihadis supported by the United States (again, aka “Syrian rebel forces”). This fact sticks in the craw of Washington officialdom. So when earlier this month Secretary of State John Kerry brokered the cease-fire with Russian Foreign Minister Sergei Lavrov… there was a substantial contingent in the Pentagon that threw a hissy fit. Cooperate with the Russians? Forget that. We know this because in late June there were already signs of U.S.-Russian cooperation in Syria… and anonymous U.S. officials cried foul to The Washington Post. “For many inside and outside the administration who are frustrated with the White House’s decision-making on Syria, the new plan is fatally flawed,” wrote reporter Josh Rogin. Huh? Presumably, if President Obama’s secretary of state negotiated the deal, it has the backing of the president. The Times’ editorial board appeared nonplussed at the notion the military would defy the president’s orders. None of this, of course, proves the attack on the Syrian army happened “accidentally on purpose,” as the saying goes. But as the septuagenarian Russia scholar Stephen F. Cohen pointed out this week, Gary Powers’ famous U-2 spy plane was shot down by the Soviets at a time in 1960 when President Eisenhower had ordered an end to such flights… but CIA chief Allen Dulles had other ideas. In other words, there’s precedent. Our geopolitical musings here have a distinctly financial point: While Washington wrings its hands over Putin’s imagined sins in Syria and Ukraine and other hotspots in his backyard… there’s a high probability Putin is planning an actual attack of the financial kind, and Washington is nigh clueless. Putin’s target — the U.S. dollar. Jim Rickards has had his ear to the ground for months… and he figures “go time” is only weeks away now. What Putin has in mind, says Jim, will amount to the third great currency shock of the last two years — on the heels of Switzerland breaking the franc’s peg to the euro and China devaluing the yuan. Fortunes are sure to be lost… and made. Jim figures if you’re on the right side of the trade, it could work out to a gain of 400% or better. Because the situation is moving so quickly, Jim has called a live online briefing for next Wednesday, Sept. 28, at 7:00 p.m. EDT. There you’ll learn the details of this Russian plot as Jim understands them… and you’ll get a glimpse at his strategy to profit from the resulting turmoil. You can watch this event free — either live or on a replay later, depending on your schedule. The only thing we ask is that you sign up in advance. You can do so right here. To the markets — which look quiet today, traders perhaps weary of parsing every word and gesture of Federal Reserve chair Janet Yellen. At last check, the major U.S. stock indexes are down about a third of a percent, the Dow at 18,325. Treasury yields keep moving down, the 10-year now at 1.62%. Gold is holding onto its post-Fed gains this week at $1,338. Crude is down 3% and back below $45 as yet another rumor of an OPEC production cut has fizzled. The lone economic number of note today doesn’t help the case for a December interest rate increase: The “flash PMI” figure, showing how manufacturing is doing so far in September, rings in at 51.4. Yes, that’s above 50, so it indicates the factory sector is still growing… but it’s way lower than Pollyanna mainstream economists were counting on. Within the report, export orders are now shrinking. To hear the Obama administration tell it, rural incomes didn’t shrink last year after all. Last week in our Saturday edition, we noted in passing that while median household income rose in 2015 for the first time since 2007… that was only a nationwide figure, and in rural areas, the number was still falling. But hold on: The Census Bureau now says it’s changed the way it’s defined “metro” and “nonmetro” areas. As such, about 6 million people who previously lived in areas designated “nonmetro” now live in “metro” areas. Thus, median household income in rural America did not shrink 2%, but in fact grew 3.4%. Don’t tell FedEx and UPS that business has no “pricing power” in this weakening economy. FedEx has announced ground and home delivery rates will rise 4.9% next year. UPS announced the same a while back, the better to pay for “system upgrades” and expansion. Two thoughts come to mind: First, neither company appears to be quaking in its boots over Amazon launching its own delivery service in big cities. Second, we shudder at the thought of how high the increases would be if oil prices weren’t still on their heels. “That’s a great question,” a reader writes after we posed the question this week whether one in five CEOs is a psychopath. “I’m wondering whether any of the publicly traded banks’ CEOs aren’t. “Not that anything substantive will come of it, but wasn’t it beautiful watching Sen. Elizabeth Warren break her foot off in John Stumpf’s hind parts in Senate Banking Committee hearings on Tuesday? “I’m no fan of any politician, but she’s the steely old girl from Oklahoma who once chaired the Congressional Oversight Panel. He’s the scoundrel chairman/CEO of Wells Fargo. IMO, it should be required viewing for every citizen. The 5: Which got us to wondering, where does ol’ Mr. homespun-goodness-Cherry-Coke-swilling Warren Buffett stand on all of this? Seriously? What in tarnation does a major bank opening accounts for customers without their knowledge or permission have to do with the election? “I constantly read in the various financial blogs, forums and newsletters that all personal debt is bad, period,” a reader writes — teeing up an intriguing inquiry. “However, I fully agree with Jim Rickards that we can expect that the dollar will be devalued by 50–80% in the coming years. “Given that, wouldn’t low-interest debt be a good thing, assuming that one has the means to service it? “For example, I currently have about $275,000 left on my mortgage at 3.75%. I have the means to pay it off if I wanted, but why would I want to? Seems I will be paying it off in dollars that are losing value faster than the interest will accrue (not to mention the tax write-off). “In fact, I’ve been offered other loans in the 2–3% range, and I’m thinking I should take advantage of them as well and use the money to acquire more real estate or precious metals. The 5: As our fine-print disclaimers often say, we don’t offer personalized investment advice… and we sure as heck don’t offer personal finance guidance! All we’ll say is to be mindful of your own words about “assuming that one has the means to service it” and know what your own comfort level is. We recall back in early 2008, the newsletter legend Howard Ruff published an updated version of his 1978 classic How to Prosper During the Coming Bad Years. In the new edition, he urged readers to borrow against their homes — even acknowledging his advice ran against his own Mormon faith — and use the proceeds to load up on mining stocks. Again, this was in early 2008. However well-intentioned the advice was, it was disastrous. Yes, Jim Rickards says the long-term future is inflationary. But you’ve got to get through the short term first. Finally, a reader’s take on Byron King’s close encounter with a self-driving Uber car on the streets of Pittsburgh. P.S. It was just over a year ago that China unleashed its shock devaluation of the yuan. In the weeks that followed, the U.S. stock market slid 11%. Jim Rickards sees the next great currency shock just around the corner. It’ll be another white-knuckle moment for stock investors… but it could also be a huge payday if you follow Jim’s guidance. Events are moving quickly. Russian President Vladimir Putin might act before Election Day in the U.S. With that in mind, Jim is organizing an exclusive live briefing next Wednesday, Sept. 28, at 7:00 p.m. EDT. Participation is free; just sign up in advance and you’re in.